It occurs to me that you might like to know a little bit more about the projects themselves as well as the wonderful people who are presenting them each week during Busy Girl Sews, so I've given you a few more details below on the Envelope Clutch. Daniar will be sharing her version of the project over at the Fat Quarter Shop's Jolly Jabber blog tomorrow, a shop which really needs no introduction at all. Suffice it to say that if you want to buy great fabric from nice people, the Fat Quarter Shop is a good place to start. 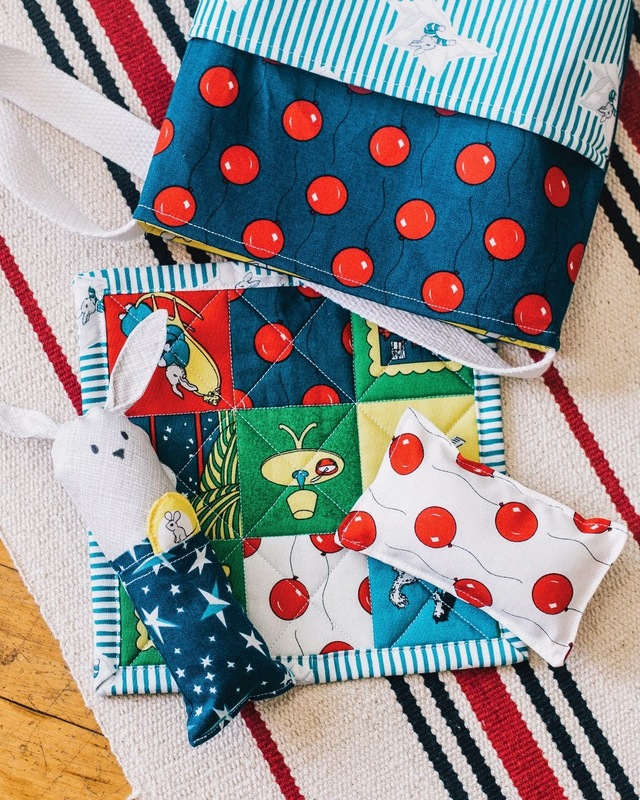 Not only do they have a staggering inventory of prints, but I love that they have always been so happy to supply prizes for sew alongs and blog hops over the years, no matter how small the bloggers are who host them. That kind of generosity does a lot to build good will in the community, and it shows. I was also thrilled to have Kimberly share some thoughts for a little interview in my book, so be sure to check that out if you have your own copy! When I designed my projects for Sew Organized for the Busy Girl, I spent a lot of time doing research in different places, including the fashion industry. Envelope clutches have been fairly popular in recent years and for good reason: the simple shape is both modern and classic. I provide two versions of the clutch in my book, a small one for manicure items and a large one for an artist's toolkit. When you look at the project, you can see that it's really a very simple sew, but I love how useful it is. So as I type this post, I'm standing at 2,999 followers on Bloglovin' which is almost inconceivable to me. The fact that all of you care enough to drop by each week and see what I'm up to -- well, I just love you guys. Your kindness is such a blessing to me in this transition period full of empty walls, stacked boxes, little sleep, and what feels like an endless supply of chaos as we prepare to move in June. I looked at my ravaged sewing room last week and could only laugh since I feel like a prime candidate for my own book right now. 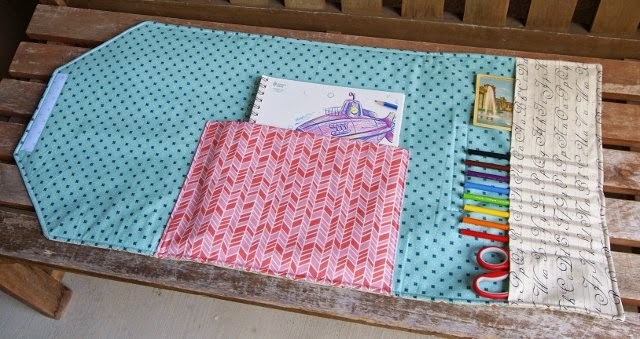 I can hardly wait to be "sew organized" again once we get settled in Texas! But meanwhile, friends, I want to share the love with all of you through some fabric care packages. Please leave a comment below telling me a few of your favorite designers, colors, and collections. I'll pick two names on Friday morning. International entries are welcome to join in. Feel free to dream big in your comments, and I'll see what I can do! Way back in October when I was swamped with Quilt Market sewing, I was also working on some projects for the February 2015 issue of Quilt Now magazine which would be featuring low volume designs. Like always, I kept things simple. The Silent Film pillow above is made of 64 black, white, cream, and gray squares from some of my favorite prints. I used eight spools of thread, generously donated by Aurifil, to quilt the pillow in a rainbow of colors. The threads go in color order across the front of the pillow, and they create an almost radiant grid as they intersect over the quiet patchwork background. This is one of those projects you really have to see in person to get the full effect. It's hard to capture it exactly through photos. The pillow is backed in my favorite floral print from Heather Bailey's Up Parasol collection. I love the contrast of the brightly colored backing against the low volume front. My second project was even simpler. I'd been seeing a lot of black and white stripes in catalogs and magazines back then, and I wanted to work these into a pillow. 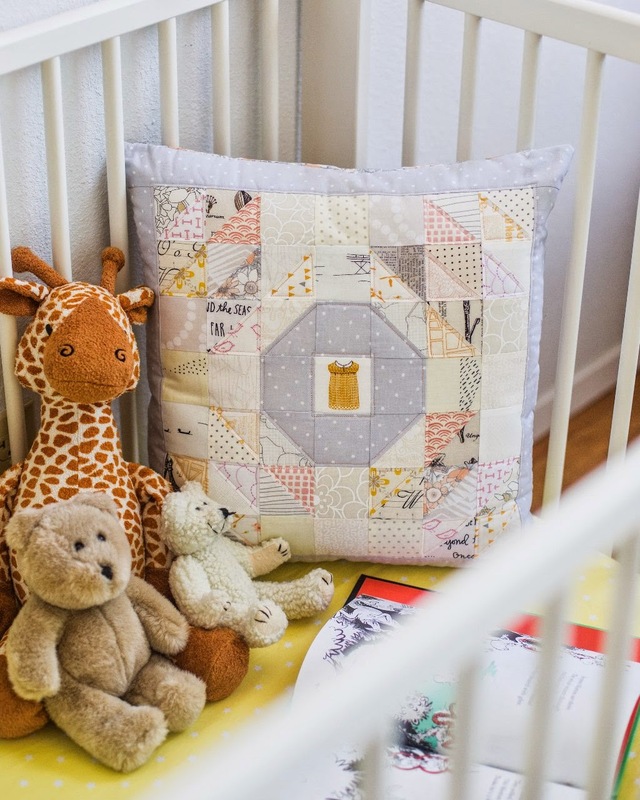 My Zebra Interrupted pillow is a lightning quick project, but it makes a wonderful graphic statement -- especially when you pair it with something floral as they did for the magazine photo shoot. I matched black and white thread to each pieced stripe, quilting them just inside the edges. Rather than matching the thread for the green stripe, however, I did my quilting in a shade of shocking pink. I used the same pink for the backing fabric, which is a leaf print by Lotta Jansdotter. Though this pillow is very different from my usual style, I had a lot of fun with it. It almost has a bit of a Kate Spade feel to me. These pillows marked my first published magazine projects. What a treat! You can get your own copy -- if you don't have one already -- right here. 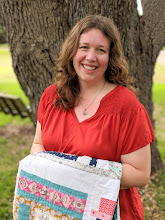 I am so excited to send you over to Leanne at She Can Quilt for today's Busy Girl Sews post because, oh my word, that girl can quilt! Leanne is a master at modern quilting. 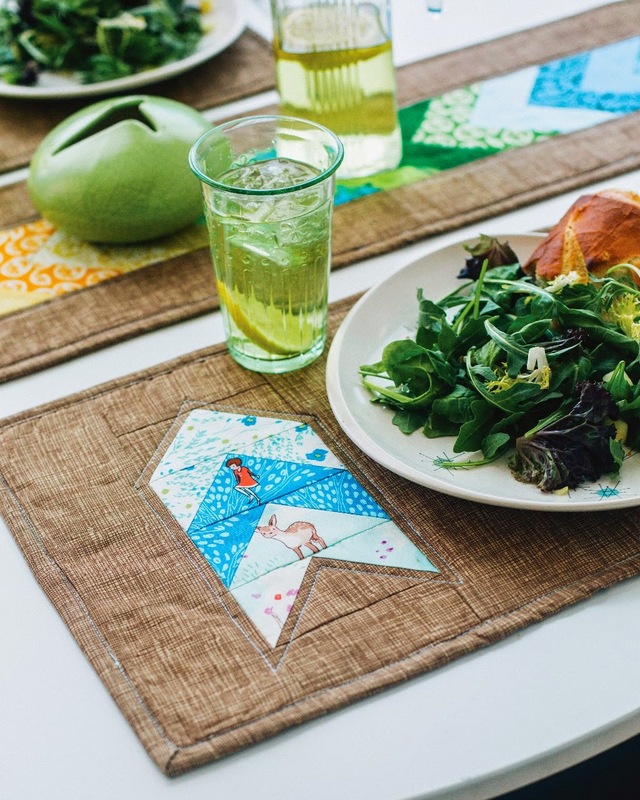 Whether she's doing improv work, her own amazing pattern designs, or the simplest patchwork, she seems to turn everything she makes into a piece of textile art. I've known Leanne for years now, and she is truly just as thoughtful as she is gifted. I can't wait for you to see her version of the Brass Ring Pillow! Thank you SO much to those of you who have left me sweet comments or sent me emails about how much you love Sew Organized for the Busy Girl. What a blessing you are! And my deepest thanks to those of you who have left kind reviews at places like Amazon, which is both encouraging and incredibly helpful. You have no idea how much your words mean to me. I truly can't thank you enough! 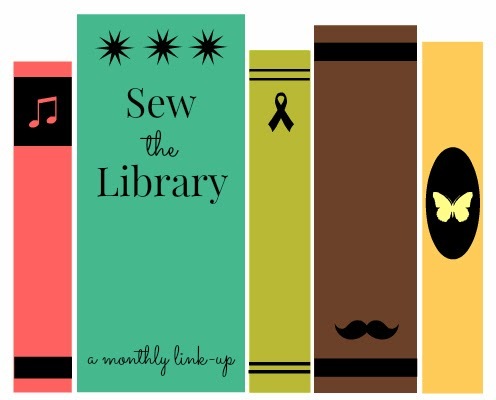 Also for those of you who have been sewing along with us for the monthly Sew the Library Link-up, never fear! My sweet friend Martha from Weekend Doings is going to be permanently taking over the link-up starting tomorrow. Be sure to link up any sewing project made from a book or magazine at her blog from the 20th to the last day of each month! I always seem to be the last one to jump on a new trend. It's not that I have anything against progress, mind you. Most of the time my reasons are either financial or motivational -- a nice way of saying that I can be a cheap stick-in-the-mud unless we're talking about something near and dear to my heart like fabric. So when the first e-readers hit the market a few years back, I wasn't interested. Nothing could tempt me to choose that little screen over holding a real book in my hands. It's taken me a while, but after letting my husband talk me into getting one for my last birthday, I've found that there's room in my life for a Kindle. I've only bought a few e-books so far, but I must admit that it's incredible to be able to click that purchase button and instantly have them ready to read. It also works wonderfully for big books which are just plain exhausting to lug around with you everywhere. I'm finally getting past the first hundred pages in Shelby Foote's massive Civil War trilogy -- which I've started and given up on at least half a dozen times over the years -- and it's just as fascinating as I knew it would be. Of course, a new electronic device means a new case, and I had so much fun sewing a little sleeve for my Kindle. I went with a patchwork log cabin design, using prints from some of my very favorite designers. This time I decided to hand quilt instead of using my machine, even adding two french knots at the center of those flowers on Ayumi's adorable teapot. The case is backed in brown linen and lined with a Paris map print. I finished it off with a leather button and hair elastic for the closure. It's simple and sweet...just the way I like it. So for those of you who've been holding out like I was, give in. Get yourself an e-reader. You don't have to use it for everything, but it's pretty great for a lot of things. Today I'm so excited to bring you Busy Girl Sews posts from two of the most gracious women in the online quilting community. I first discovered Lindsay of Craft Buds through the Craft Book Month blog hop, an annual celebration of books for makers everywhere. Lindsay has always been such a champion for community, inspiring people to sew and share together. I love her sweet spirit and creative projects, and her Modern Bee book has been an undeniable hit. Just wait till you see what she did with the Sleepy-Time Friend Kit! From the moment I met Debbie of A Quilter's Table online, I was so touched by the way she was constantly cheering on everyone around her. She must leave hundreds of comments on sewing blogs each month, spreading encouragement around the globe. Debbie is an enormously talented modern quilter, and I never ceased to be amazed by her projects, my favorite so far being her stunning Unlocked quilt. Since she's also an avid foodie, Debbie chose to sew my Chevron Table Set for this tour -- such a perfect choice! 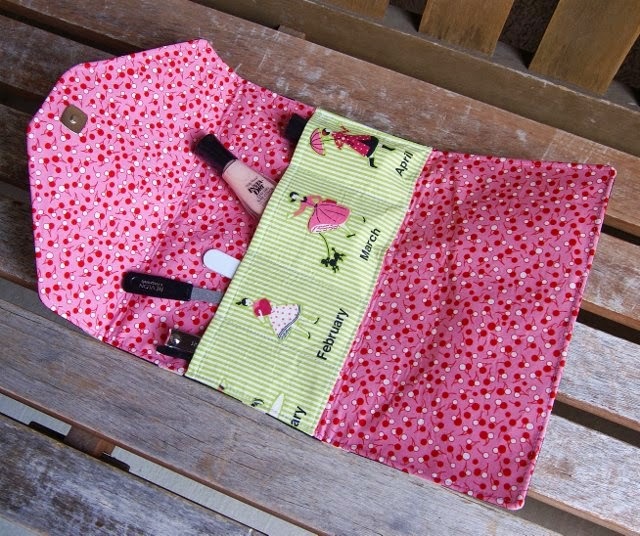 Today I have two lovely stops for you to make on the Busy Girl Sews Tour! I'm pretty sure that my first introduction to Angela of Cut to Pieces was her legendary Where Bluebirds Fly mini quilt. Angela has so much talent. 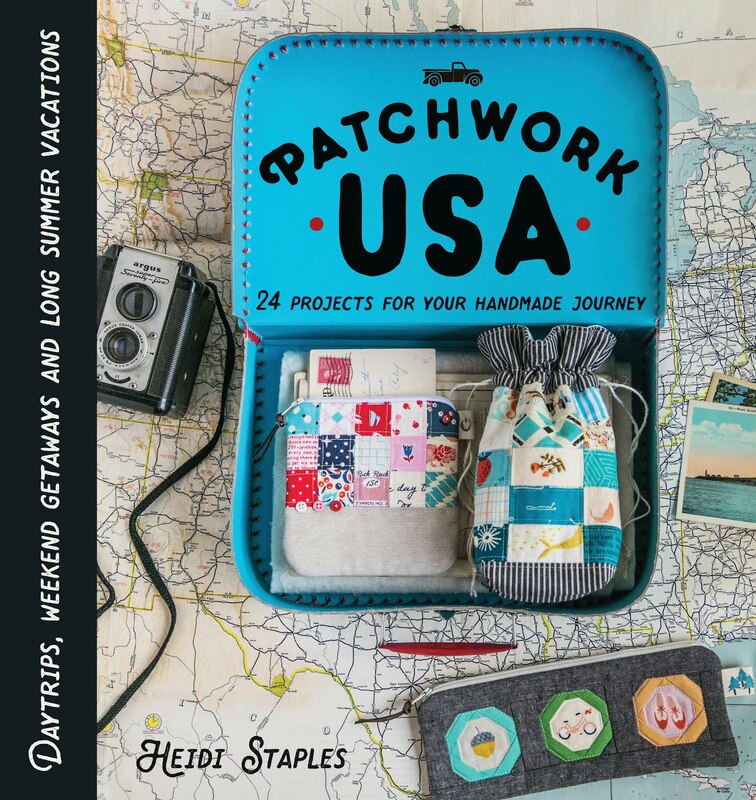 Not only does she sew gorgeous projects of all kinds, but she's written A Quilter's Mixology, a fabulous book on sewing curves, and even done a little filming on the same topic. This is not a quilter to miss, people! 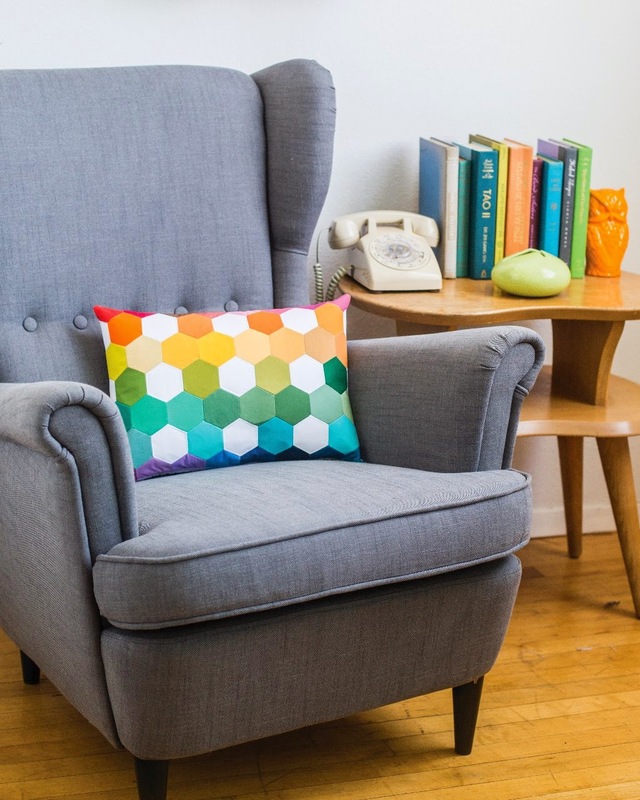 Angela will be sharing her version of the Dotty Hexagon Pillow. Long before she wrote Tales of Cloth, I met Jodi through her former blog name, Tickle & Hide. Jodi is a truly gifted quilter and an equally brilliant writer. I absolutely love reading her blog posts about family, faith, and sewing in the Australian countryside. Her friendship has been such a blessing to me over the years, and I'm so thrilled to have her as a part of this tour. 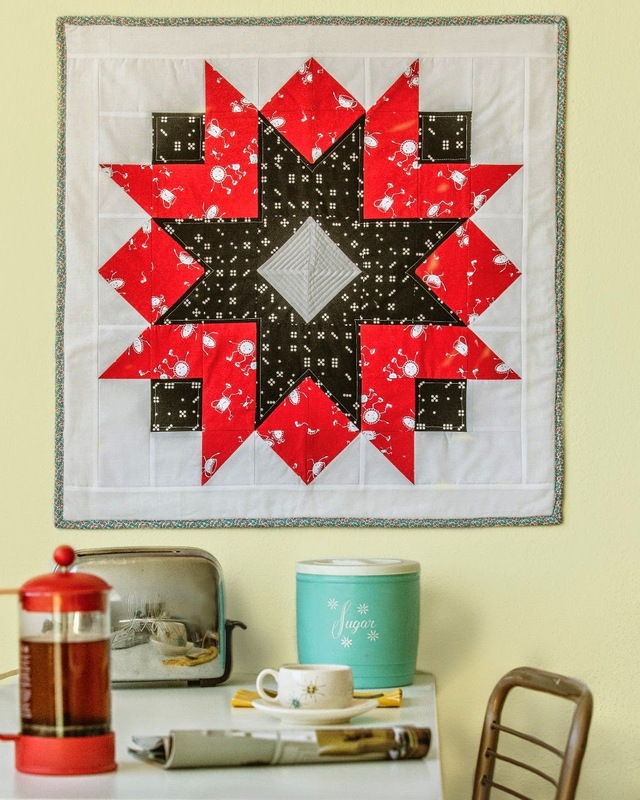 Jodi is sharing a stunning version of the Starlet Mini Quilt. If I had to pick a favorite collection from 2015 so far, it might very well be Folk Song by Anna Maria Horner. 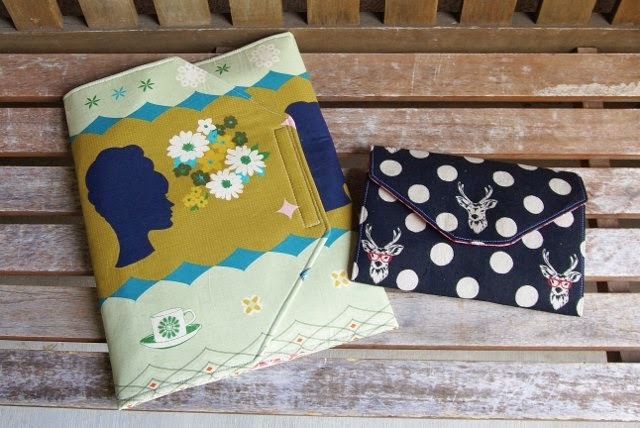 Her beautiful designs and stunning range of colors absolutely make my heart sing, and I knew that I wanted to use these prints to make the cover of my new sewing notebook. While I designed this particular cover myself, I was heavily influenced by Jennie's adorable Scrappy Little Planner Tutorial which you absolutely must see. Mine is far more simplistic, but it works for what I needed. I added a small amount of quilting to the log cabin design on the front, leaving the fussy cut bouquet on the back to shine all by itself. Every time I look at this cover, my breath catches again at those incredibly saturated colors. I added an elastic pen holder to the inside of the cover and bound the whole thing in yarn dyed Essex linen in leather. This mini notebook from Target is my latest idea for keeping all my ideas in one spot. Now I have a beautiful place to store my notes on project designs, blogging topics, and sewing classes. If you look closely, you can see that I too am enjoying Creativebug's brilliant series on How to Design Fabric. I'm hoping to sneak in another class tonight along with a cup of tea and a chocolate chip cookie. It's become my favorite way to end the day.